Sign Up for my Arts Newsletter for the latest news and exclusive free downloads! Also Follow Me on Instagram - IG: @brucerimell - with some of the latest updates from my studio. I am very honoured that my 2013-14 artwork Fernal Ocean Garden has been selected for this Irish group show on the theme of menstruation. The exhibition will showcase artworks, poetry and writings from a multitude of creatives seeking to address, respond to and highlight the various aspects of a subject which even in the modern world is shrouded in taboo. For me, there are similarities between the menstrual and the queer, not least that they are both often rejected from the respectable world of comfortable morality, and this piece from my Fernal World series envisions a life-affirming menstrual paradise, because why not? I am delighted to be returning for a fourth time to the town of Melkhoutfontein, Western Cape, South Africa, to continue the final phase of the PaintUp with Kamamma mural initiative with Dreamcatcher South Africa. This project seeks to restore the cultural memory of the community of Melkhoutfontein, and help to build a prosperous future for the people by transforming their town into a photographic tourist destination. I am extremely proud to be invited back yet again to continue our shared painted journey into community pride with the help of volunteers and locals, inspired by the prehistory and rock art of the region. Photographic updates to follow as always! 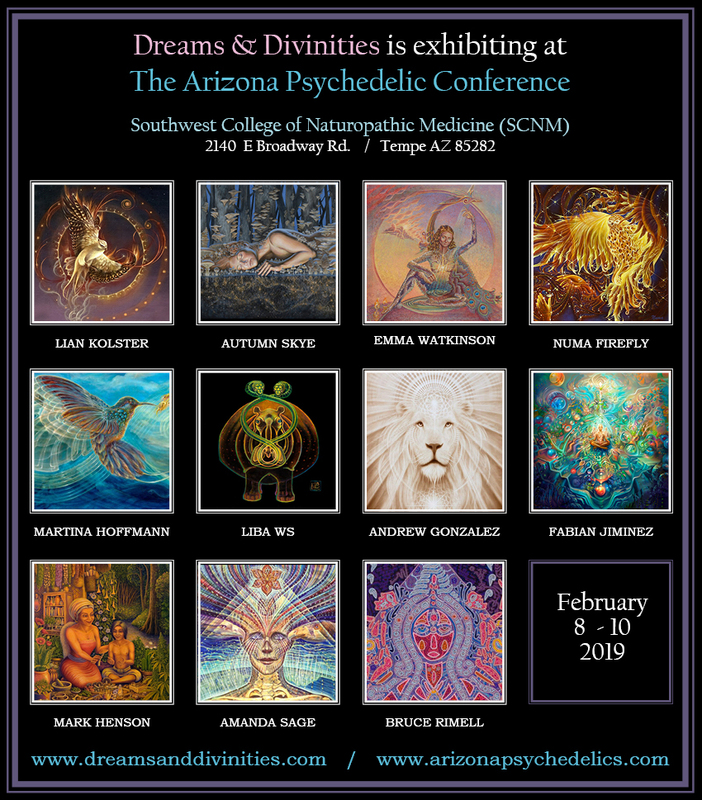 I am thrilled to announce my participation in the gallery exhibition for this international conference taking place over two days in Arizona. The gallery is yet another wonderful Dreams & Divinities initiative, and features the glittering work of nearly 20 artists including myself. High-quality reproductions of my Afer The Fernal Creatrix and What I Saw In The Blue Sky will be featuring, and there are plans to have the exhibition tour throughout the USA as part of several conference and spiritual gathering galleries run by the Seeds of the Anaconda initiative - watch this space for more news in the future! Several new image galleries are now visible on this site, including Coca Seeds, a series inspired by my 2017 visit to Colombia, Liminal Contact, a small-scale series of experimental illustrative works, and two new works in the Visions 2017-18 gallery. I have also resurrected my Salviaspace project from the archive, with a representative sample of artworks inspired by this visionary sensations of salvia divinorum: some new work from 2013-14 is also accessible here. There are also some exciting updates on The Voice Project including a new work-in-progress film! I am delighted to announce my participation in the world-renowned Chimeria Festival of Visionary Arts and Sciences 2018 in Sedan, France this October, as part of the Dreams & Divinities arts initiative whose artists are exhibiting as the Invités D'Honneur this year. I am celebrating my inclusion in this exhibition by producing a large format, dual image artwork entitled Only One Track Leads Heavenwards which draws from transformational experiences during the previous Dreams & Divinities event in Colombia in 2017. An Open Event takes place on Saturday 6th October 2018. I am thrilled to announce the second venue for this exhibition of selected artists celebrating the themes of the deer in art. Twenty-four contemporary visionary and surrealist artists have been invited to join this show in the magical setting of the in the Centre de l’Imaginaire Arthurien in a Chateau situated in the heart of the Forest of Brocéliande in Brittany, France. I have contributed my 2014 Dual Image artwork Fernal Underworld Garden from my 'Fernal World' series, and I'm deeply honoured to be part of this show. An Open Event takes place at the Chateau on Friday 20th July 2018. An exciting new perspective on visionary beings and other mind-blowing phenomena encountered with strong psychedelic plants and drugs comes with the publication of the third volume in my 'Visionary Humanism' series of books. Here, a rational analysis of those strange otherworldly 'elves', shadow people and visionary beings is undertaken in several ways, from an anthropological survey of their common appearance in religion, folk-beliefs and visions of peoples throughout the world, to a psychological model of how these experiences arise which draws upon the cognitive science of religion and evolutionary psychology to initiate a new type of conversation about psychedelic phenomena: a cognitive/evolutionary visionary one. Beautifully illustrated with over 35 illustrations, this book will be released March 2018, and will be available from this site, as well as from Lulu and Amazon UK, USA and globally. I am thrilled to announce my participation in an exhibition to accompany the 'Semilla de la Anaconda' gathering of indigenous people, shamans and artists taking place in the Sierra Nevada de Santa Marta indigenous reserve in Northern Colombia. This exhibition is a collaboration between Dreams & Divinities and 'Semilla de la Anaconda', and a programme of mural painting and ceremonies is planned for this shimmering meeting. I will be in attendance, and have created a new work - Chiguexica Muisca - celebrating the return of the Muisca ancestors, to exhibit along with a glittering array of other luminaries! The Voice Project - UV Update! My Voice Project, my initiative is to create a 13 panel, 33 foot long visionary mural expressing the imaginal and mythical visions of the Island of Britain, has reached an interesting stage, with the acrylic underpainting and the first draft of the UV image completed. I have also significantly overhauled the Voice project exhibit pages here on my website, and beautiful scans of the latest stages can now be seen, including the UV image that lends a powerful sense of the project's magical, mythical imagery. Though I've been working on this since 2010 in one form or another, there's a long way to go yet!